One of the earliest and most interesting studies of wombats and their burrows was made in 1960 by a schoolboy, Peter Nicholson, who was then a student at Timbertop, the country branch of Geelong Grammar School. 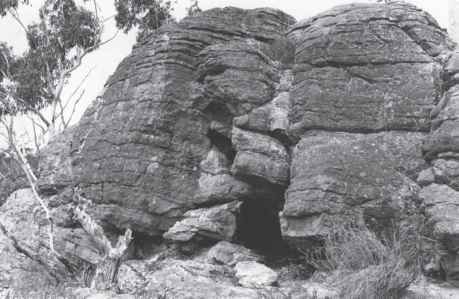 This school is situated in the foothills of the Great Dividing Range in north-eastern Victoria, and it was in these forested hills, between 500 metres and 1300 metres above sea-level, that Nicholson made his subterranean explorations of bare-nosed wombat burrows. Armed with a torch, a mattock and spade, and half a kerosene tin for his booty, he crawled along the narrow tunnels, sieving the floor dirt to remove any bones he found there. He eventually amassed enough to assemble a complete wombat skeleton. Nicholson also mapped several burrows by driving pegs into their floors and stretching cords between the pegs. He drew a plan of one of the larger burrows he explored, and he also made many interesting observations of the wombats themselves. The written account of his wombat study, which was entered for a students' science competition and later published in the school magazine, is still one of the most useful in-depth studies of wombats that has been published. In 1968 John Mcllroy, of the CSIRO Division of Wildlife and Ecology in Canberra, began a three year study of the ecology of the bare-nosed wombat. McIlroy, being larger, older and not as adventurous as Nicholson, did most of his investigations of burrows from the outside, although he did crawl up to three metres inside some of the larger burrows. With the aid of a torch and a flexible pole three metres long, or, for longer burrows, a plumber's 'snake' (a long flexible steel cable used for clearing drains and sewers), McIlroy examined 197 burrows. He classified them into three groups, according to their length: minor burrows, only about 1-1.5 metres long; medium burrows, 1.5-5 metres long; and major burrows, more than five metres long. 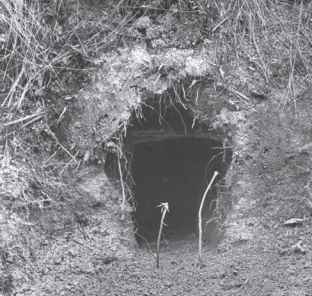 Smoke was forced down burrows to determine whether there were inter-burrow connections or whether the burrows had only single entrances. He also located wombats' positions in their burrows by radio-tracking, and during another study, in 1979, he excavated seven wombat burrows and took their internal measurements. From Peter Nicholson's account and John McIlroy's detailed research into all aspects of burrows, as well as some observations of my own, some general conclusions about bare-nosed wombat burrows can be drawn. 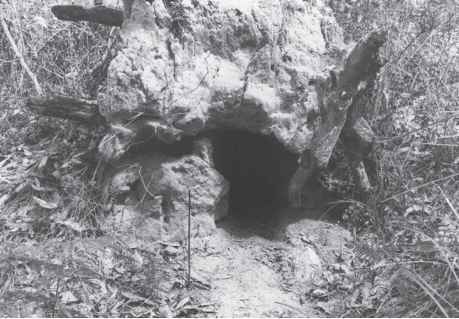 A typical major burrow, one that has been used by many generations of wombats, has a large mound of soil outside the entrance. This soil, loosened during the excavation of the burrow and during many renovations and extensions since, often occupies a considerable area, usually about 2.5 square metres but often as large as eight square metres. A medium burrow has a smaller mound, but it is still conspicuous; a small overgrown mound is sometimes all that remains at a minor burrow. At a freshly dug burrow, or one recently cleaned out or extended, the soil is still loose and fresh. It gradually becomes compacted over the years, and the mound may be eroded away. Much of it is subsoil such as clay, and this, as well as the regular use of the burrow by heavy-footed wombats, often prevents the mound of a major burrow from becoming overgrown. Signs that a burrow has been recently occupied are frequently seen on or near the mound. These signs include tracks and scats (i.e. faeces) and also the scratch marks made by the wombat's strong claws (Figure 3.1). Figure 3.2 This burrow entrance is partly supported by a large horizontally growing root. Notice the bitten ends of roots and stalks around the entrance. by many wombat bodies, for they sometimes leave their burrows to drowse in a sheltered spot in cool to mild weather, particularly on overcast days. All the sits I have found have been in shaded positions, but other observers have recorded wombats spending some time in their sits basking in the morning or late afternoon sun. The sit is also often used when a wombat leaves the burrow in the evening; before setting out on a foraging expedition, it will pause at the sit, sampling the air for scents and sounds. The entrance of a well-established major burrow is well-worn and often very large - sometimes large enough for a man to crawl through easily -and both major and medium burrow entrances are generally at least half a metre high and nearly as wide. The entrance is usually single and either oval or shaped like an inverted U. Frequently, some of the roots from nearby trees or other plants help to support the entrance, while the broken ends of other roots that have been bitten through or scratched away are visible (Figure 3.2). The entrances to minor burrows are small, and some are too small for a bulky adult wombat to enter. Many major and medium burrows are dug on sloping ground - the steeper the slope the less danger there is of flooding from surface run-off from the slope above - and they usually extend horizontally into the sloping bank or hillside (Figure 3.3). 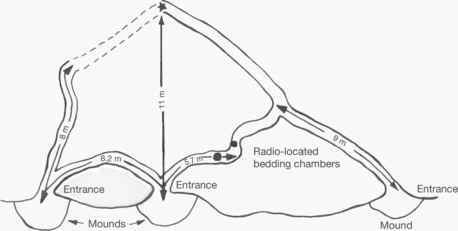 Some major and medium burrows and many minor burrows are dug on flat or weakly sloping ground, and these usually descend steeply at first, for a distance of 0.5-5 metres from the entrance (Figure 3.4). downward, and the tunnels also often rise and fall slightly, forming small humps and hollows. Some of these hollows are enlarged by the wombat into oval chambers, which vary considerably in size - on average they are about one metre long and 0.5 metre wide - and these may be used as resting chambers. Most major and medium burrows have at least one or two resting chambers, which may be either unlined or lined with vegetation. McIlroy found that this bedding material usually consists of bracken fronds, eucalypt leaves and twigs, strips of bark, and sometimes small tussocks of Poa grass and the leaves of other plants. I have watched a wombat biting through the stems of several fronds of cartilage fern (Blechnum cartilagineum) which grew near her burrow. She then walked backwards towards the burrow and then into it, continually raking the fronds towards her chest with her front paws. Leafy twigs are probably taken into burrows in the same way, but some of the leaves and twigs that are found in burrows may have been blown in or dragged in accidentally by the wombat's feet and later scratched into the resting hollows. Apart from leaves and twigs and other vegetation, the floor of a wombat burrow is clean and, in dry weather, dusty. Scats, either old or fresh, are not found in any part of the burrow. measured with a plumber's 'snake'. As the wombat was located 11 metres directly in from the entrance of the middle burrow, which was a greater distance than the recorded lengths of the tunnels, it was probable that the burrow system was very long indeed, as is shown in the scaled plan. Other very long burrows have been measured. 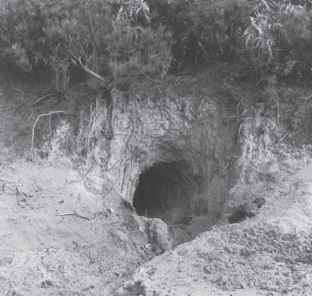 Finlayson recorded an attempt to dig out a wombat that had to be abandoned when he had reached a distance of 10.2 metres in from the entrance and 1.8 metres below the surface, and Troughton referred to burrows explored by the 'open cut' method that were up to about 30 metres long. Peter Nicholson also measured burrows up to 18 metres long, not counting the network of tunnels. Complex burrows form over long periods, and they are usually found only where burrows are clustered together because there is a limited area of favourable ground available for digging. Where there is ample suitable ground wombats space their burrows much more widely apart, and there is little chance of their becoming interconnected. Figure 3.6 A fallen tree provides the entrance to this burrow. wombats seem to prefer to dig in places where the earth has been exposed, such as under the bases of fallen or standing trees (Figure 3.6) or under rocky outcrops (Figure 3.7). They tend to exploit natural weaknesses, where excavation is easier, and in rocky, mountainous country many burrows are located beneath the rocks and boulders. Not all burrows are dug into slopes, and by no means all become major burrows. A wombat will scratch out the beginnings of a burrow almost anywhere. Many burrows, begun in unsuitable places - such as creek beds and hollows, on the lower banks of creeks, rivers and swamps, and on flat ground, all of which are susceptible to flooding - will be abandoned before they are one to two metres long. These minor burrows are rarely used by the wombat, except perhaps as a temporary shelter in an emergency. Often they become overgrown, as a horseman has occasionally found to his sorrow. Rabbits sometimes take them over and extend them for their own purposes. Sometimes a burrow may be begun where all the conditions are favourable but still be deserted by its originator for some reason - perhaps because it died or left the area. This minor burrow may be reworked later on by another wombat and gradually extend to the status of a medium burrow, and after an even longer period, may become a major burrow. Most of the longer burrows (15 metres or more) are probably the work of several wombats, although occasionally a single wombat can, by excavating furiously, construct a major burrow in a short time. One wombat I observed dug a burrow more than six metres long in less than a week. Digging into the vertical sandy bank of a dry swamp, he progressed at the rate of about two metres a night. Usually he dug for only an hour or so at a time, emerging to feed in the vicinity of the excavation before returning to it for another bout of digging. When the burrow reached a length of six metres it changed direction, and I was unable to measure it further; but judging by the vast amounts of sandy soil that were regularly ejected from the burrow for the next 10 nights, it was considerably larger by the time he ceased his digging operations. On other occasions when I have watched wombats digging in harder ground, the going was slower. A young semi-tame wombat watched by Mcllroy dug at the rate of one metre per night. A burrow is not the exclusive property of any individual bare-nosed wombat; a major burrow may be used by several different wombats, but usually at different times - an arrangement that can be compared with the 'time-share' system now in vogue among users of holiday flats and homes. Sometimes 'double-bookings' occur, and a wombat will enter a burrow that is already occupied by another. Usually this is tolerated, but occasionally one may be chased out - an immature wombat by an adult, for instance. There is some limited evidence that adult females, around the time of gestation and with very small pouch young, may have a preference for a particular burrow and maintain exclusive use of it for a period. 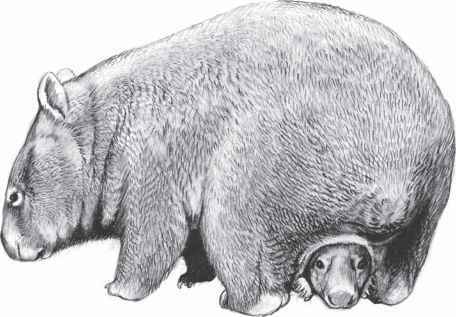 This may also occur when the young wombat first begins to emerge from the pouch (see Chapter 6).